Sometime around my sixtieth day in Vietnam I was named 548 driver. Incidentally, this was a significant day because in two hundred and ninety-nine days and a wake-up, I could go back to the world. A 548 is a track vehicle that was used to haul cargo or people. It was big and weighed twenty five tons. I loved that thing. As any 548 driver will tell you, one has to take care of that vehicle. As the newly designated 548 driver, each morning I was off to the motor pool to take care of my baby. I checked the oil and greased the tracks, and then wiped it down with a cloth dipped in diesel fuel from one end to the other. Each day when I finished, it shined like a brand new penny. I had a manual that I studied to know everything about it. That thing was in perfect shape, except for one thing. It did not run. The motor was blown. Another good thing about being 548 driver was that you passed the EM club on your way to the motor pool. After hours of work, it took several hours in the EM club to get ready for the rest of the day. There’s nothing like an early morning beer buzz. One morning as I took care of my 548 there must have been a general or group of generals somewhere planning some big operation, because after a couple of months a brand new motor arrived. Now this thrilled me in some ways, but scarred me in others. Using my simple, back-woods South Carolina mind, I had reasoned that as long as that sucker didn’t run, then it couldn’t go anywhere, and if it couldn’t go anywhere, then I didn’t have to go anywhere. That group of generals knew a whole lot more than this poor hillbilly from the foothills of South Carolina. They meant for that 548 to run, and by golly it did run. They made it happen, and I admire them for their forethought. Just think, they may not have been able to invade the sovereign territory of Cambodia had my 548 not been running. The motor pool guys put the new motor in and she purred like a kitten. It ran like it was brand new. Come to think of it, she probably was brand new. It could not have been driven very much. A 548 has a circular attachment above the cab to hold the fifty-caliber machine gun. When we mounted that fifty, she was one mean looking machine. I’ll bet Charlie was quaking in his sandals when he saw us mount that gun. He had to know we meant business then. The motor pool sergeant said that I should take it for a spin. He knew how hard I had worked on maintenance each day. There was only one problem. Even though I had been 548 driver for two months, I had never actually driven it, or for that matter any track vehicle. In fact, no one had shown me how to drive it. At this stage of my army career, I had nine months as a highly trained army trooper. Remember, eight weeks of basic training and eight weeks of advanced individual training. Just think, June 25, 1968, I was a civilian. Then, thanks to the draft, on June 26, 1968, I was a soldier, of course not highly trained at that point. I had watched the more senior guys in the gun section drive the big gun so I had an idea about how to work the controls. I had studied the manual. I knew that I was ready. The army had confidence in my ability. They had shown that by promoting me to specialist fourth class. In just nine short months I had gone from a lowly E-1 draftee to the rank of Specialist Fourth Class. I believe my salary had risen to $145 a month. That was a lot of money in 1969 when two dollars would buy a carton of Salems. And every self-respecting GI that went to Vietnam knows what a carton of Salems would buy. I had become pretty good friends with the motor pool fellows, as I was spending a great deal of time there and you remember I had my obligations at the EM club. Soon the motor pool guys just met me at the EM club where I had managed to be named part-time barkeep. Working in the EM club was a whole lot more fun than cleaning the gun or maintaining my 548. The big day arrived. I took the driver position, let the glow plugs warm, turned the switch and the 548 roared to life. I had talked someone into riding with me. I don’t remember whom, but I think he had been in the EM club that morning. 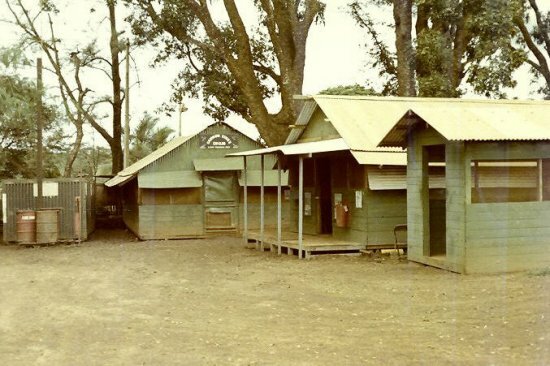 Quan Loi had been a French rubber plantation before army engineers transformed it from an oasis to a forward area base camp. Forward meaning it was a long way from Saigon. The top of the hill had been cut down and a landing strip placed where I’m sure there had once been a beautiful golf course. I always wondered why the jungle just beyond the perimeter was so lush and green, and where we stood there was nothing but red dirt or mud, depending on the season. Nothing green in that dirt, absolutely nothing. Was it Dow Chemical that had the slogan “better living through chemistry?” We now know why nothing grew. Thanks Agent Orange. Back to the big day. The motor was purring as I gripped the controls. My buddy-riding shotgun asked, “you sure you know what you’re doing?” “Why hell yes!” I replied as I tried to figure out how to make it go forward. We eased out of the motor pool on to a road that ran around the perimeter of Quan Loi. I was proud that day. I was actually driving the beast, and it was wonderful. As we rounded the end of the runway a small private plane was landing. This was an unusual sight. In fact I had never seen a private plane land at Quan Loi. I stopped the 548 and we watched the plane. I stood on the seat fancying myself as General Patton would probably look had he been a Specialist Fourth Class 548 Driver in Quan Loi, Vietnam (republic of). The plane taxied over to a waiting French car. Out of the plane came the most beautiful woman I think I ever saw. She smiled at me and said, “Bonjour”. You know I thought that I had died and gone to heaven, but I knew that I was slap dab in the middle of hell. Well she smiled and I smiled, she waved and I waved back, but alas, she got in a car with a Frenchman and I never saw her again.